What is oatmeal? It’s one of the world’s most versatile, familiar foodstuffs. But how many of us know more than that? What’s it like in “raw” form? How many ways are there to prepare it? These questions form the backdrop of a fun holiday: National Oatmeal Day on October 29. Maybe you like oatmeal “rolled.” Perhaps you prefer your oats “steel-cut not milled,” like some sort of James Bond figure who’s more fond of manganese than martinis. Regardless, there’s a way to prep oatmeal that satisfies your cravings, even if it’s just regular ol’ “porridge” — which is another story. The Quaker Mill Company started in Ravenna, Ohio. It would later become Quaker Oats. Johnson's "A Dictionary of the English Language" described oatmeal as a grain "which in England is generally given to horses, but in Scotland supports the people." ​​Great Scot(s), that's tasty oatmeal! The Scots have eaten oatmeal for centuries; the grain itself grows well in that part of the world due to that country's low temperatures and high humidity. According to some historians, the wild ancestors of modern oats were prevalent in Asia. But they weren't domesticated until sometime in the first millennium BCE in what is now Central Europe. Oats are one of humankind's earliest cultivated foods. In fact, the ancient Chinese knew all about the grain. Many fitness experts swear by steel-cut oats, which have a pleasant chewy texture. Prepare a bowl and get your day off to a nutritious and filling start, the natural way. There are a lot of ways to celebrate National Oatmeal Day that may have your doctor shaking his head but will have your taste buds jumping for joy. Oatmeal raisin cookies, apple and cinnamon oatmeal, brown sugar oats. We're getting hungry just thinking about it. A lot of people go without food every day right here in the U.S. Many homeless shelters accept oatmeal since it's an easy and nutritious way to fill the bellies of the less fortunate. Consider donating a big batch of packaged oatmeal to a local shelter or to your church. The "Quaker Man" has adorned Quaker Oats since 1877, when he became the first registered trademark for a breakfast cereal in America. ​Many people take oatmeal baths in order to rejuvenate and soothe their skin. In fact, oat-based products are awash in proteins, enzymes, vitamins, and antioxidants that apparently make excellent additions to one's skin regimen. 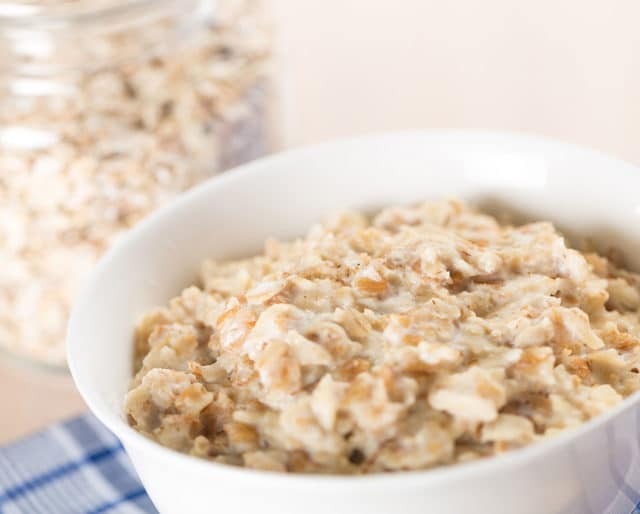 ​According to research, an estimated 75 percent of U.S. households have oatmeal in their kitchens right now. If people aren't making oatmeal for breakfast, they're baking oatmeal cookies for dessert. And in between? Meatloaf! Yup, oatmeal is used for, among other things, holding that savory dish together. ​Peas porridge hot, peas porridge ... oats? ​Although the terms are often used interchangeably, porridge and oatmeal are not necessarily the same thing. Oatmeal is a kind of porridge, but porridge can be made from many things other than oats. Whether it's saturated with brown sugar, baked into cookies, or prepped as plain as the day is long, oatmeal is a truly, wonderfully, satisfyingly delicious snack. And you can eat it at any time, day or night, breakfast, lunch, or dinner. Depending on how it's prepared, oatmeal has definite health benefits. Oatmeal is mostly water. It's also low-fat and stuffed with essential nutrients, such as manganese, phosphorus and zinc. Plus, experts say consuming oats can reduce the risk of heart disease. Oats are a hardy grain. They tolerate rain well while growing (better than most grains, anyway), and can be planted in fall or springtime. Plus, oatmeal is a staple of food culture the world over.